I’ve been away these past seven months. Sadly, not to a place with warm, sandy beaches and overpriced umbrella drinks, but to an abyss of despair so deep I never thought I’d crawl out. But thanks to a 20-year-old coincidence, I’m back in the land of the living and brought back a souvenir of experiencing pure happiness. I’m hoping that by sharing my “vacation” pics, it’ll give you a new perspective on life, or at least make you less pissed when your kid loses his retainer yet again. Last year, my fearful daughter gathered every ounce of courage and chose a college across the country so she could pursue her dream of living in New York City. She was terrified of leaving home and would have gone to college in my uterus if I could put a bookstore and a Starbucks in there. I spent the weekend with her, setting up twinkle lights in her dorm and chowing down on carb-filled treats, and flew home to adjust to life as an empty nester. The very next morning, I got a call from her doctor saying something was very wrong. She had missed a few periods over the summer so he wanted to run some tests. I opened up her medical portal so I could follow along and stared at the sea of red alerts, some of her numbers being 10 times higher than normal. “She needs an ultrasound of her liver sooner rather than later.” I hung up in shock. How can that be? She just ate her weight in bagels and pizza? I was a puddle of despair but held it together enough to get on a plane and pretend to be strong. My daughter and I held hands as we sat together on that paper-covered table, terrified what the doctor would say. He told us, a memory that will forever be singed in my brain, that she didn’t actually have cancer but an enlarged lymph node reacting to whatever was wrong with her liver! We both broke down in an emotional heap, crying the happiest of tears and clinging to each other like entwined vines. So off she went to a liver specialist who ordered a liver biopsy, an endoscopy, a colonoscopy, contrast scans, and more blood work. The final diagnosis: primary sclerosing cholangitis (PSC)—a rare, progressive, incurable, and life-threatening liver disease in which the bile ducts inflame and damage the liver, causing ultimate failure. As it fails, my beautiful daughter will experience exhaustion, round-the-clock itching, pain and nausea, and infections that would warrant emergency-room visits, where stents would be inserted into blocked bile ducts. The doctor told us that because some states have higher transplant rates than others, when her liver is damaged enough to warrant her being placed on the transplant list, she would need to move to another state because the state she lives in would have little chance of finding a transplant in time. If she does get a transplant, there’s risk of rejection and infection, and a more than 30% chance of recurrence. Oh, and this disease carries with it a 400 times greater chance of the patient getting a rare, aggressive form of cancer that’s rarely curable. 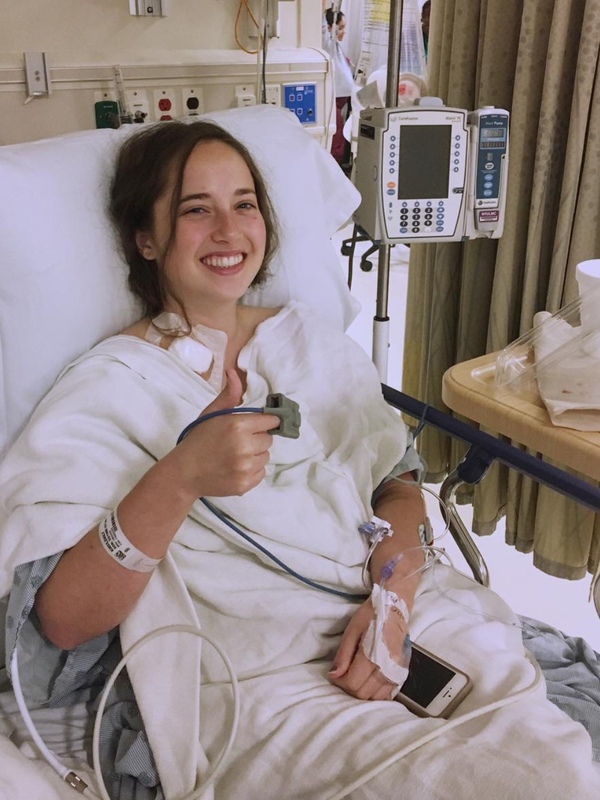 Her liver was already extremely damaged, which is why she stopped having her period, and, as the doctor explained, she was at the edge of the cliff, about to fall into cirrhosis, a point where scarring occurs and there is no hope of liver repair. I held my terrified daughter and told her not to worry, that there is still plenty of hope. All she needs to do is go to school, and I’ll do the rest. “I got you,” I assured her, and, like countless times before, I told her everything was going to be OK. But unlike the other times, I knew I was a liar, liar, pants on fire. I flew home, where I cried every day, couldn’t sleep at night, and woke up with a wave of terror crashing over me every morning. I longed to be back in the land of the living, with other moms who had healthy kids. I tried as hard as I could to push away the image of living in a world without my child, but I was rarely that strong. From my abyss, I spent hours doing research. I learned everything I could about the liver and biliary tree. I joined online support groups and wrote into morning news shows and medical journals trying to spread the word. We even were on an episode of The Doctors. I was doing everything I could to “Lorenzo Oil” the hell out of PSC. But then I read an article about a doctor who, 20 years before, gave a PSC patient an antibiotic for another condition, and it drastically improved his PSC symptoms. The doctor tried it again with another patient, and it worked like magic. You’d think a breakthrough like this would lead to clinical trials and a possible cure, but no. Because PSC is a rare disease affecting relatively few patients, a clinical trial wouldn’t make financial sense. I was desperate to get my hands on this drug, but despite my begging, none of our four doctors would try it because it’s not FDA approved for PSC. I wrote a post on the support site asking if anyone had a doctor willing to prescribe it, and I got a response from a father in New York whose college-aged son got a prescription for it the month before. I made her an appointment and jumped on the next plane. “The drug doesn’t work all the time,” the doctor explained. “And it has the worst results if cirrhosis has set in, and you’re just about there.” There are also no studies on its long-term use. “It’s only given for seven to 10 days, and you’ll need to take it for years, possibly decades, until a cure is found.” But knowing the alternative, my daughter quickly agreed, and an hour later, I was holding the beautiful vial of hope! Six weeks later, my daughter took her first blood test. With my heart pounding, I opened up her portal and looked at the results. All I saw was a sea of green! Every single number was normal! The very next day, after a 14-month absence, she got her period! The doctor confirmed this meant that her liver is actually healing! I took a picture of his message, and it’s now my screen saver. Every time I open my phone, it’s like my superpower, enabling me to look at the world in a brand-new way. Car breaks down? Who cares. Gained five pounds? Whatever. He didn’t ace an exam or she forgot to put away her Legos that you stepped on yet again? So what. Nothing, and I mean nothing, matters but the health of your child. N-O-T-H-I-N-G! There isn’t a that day goes by when I don’t think about that horrible dark abyss, take a deep breath, and feel pure, utter happiness. In addition to that tidbit of knowledge, I picked up a few other morsels of wisdom I want to share with you. 1. Hope is the greatest thing. It opens the path to the seemingly impossible. 2. Support is the next greatest thing. Before my daughter’s diagnosis, I had always been on the giving end of support to my village of friends. I had no idea how much it meant, and it means everything! 3. Most pediatricians don’t do blood work. Ours never did. If yours hasn’t, ask for it. That way, if there is a problem, you can catch it early. 4. Use the internet. Although most people will tell you never go on the internet to learn about a medical condition, I disagree. Without my searches, I would have never discovered this drug or the support group, and my daughter’s liver would still be deteriorating every day. 5. Be your own advocate in the medical world. You must! 6. Donate to rare diseases. When we thought my daughter had cancer, there was a ton of information and treatment plans available, but with rare diseases, it’s all tumbleweeds. If you feel inclined to give to my daughter’s disease, go to PSC Partners Seeking a Cure, but give to any disease that doesn’t have a celebrity sponsor or yearly telethon. Have you or your child faced a challenging medical diagnosis? What would you tell another Solo Mom facing a similar challenge?